In the fall of 2012, motivated by concerns about how the actual and perceived limitations of copyright can inhibit the creation and publication of new work in visual arts communities, particularly in the digital era, the College Art Association commenced a four-phase project to develop and disseminate a Code of Best Practices for Fair Use in the Creation and Curation of Artworks and Scholarly Publishing in the Visual Arts. Supported by generous preliminary funding from the Samuel H. Kress Foundation and a major grant from the Andrew W. Mellon Foundation, CAA engaged Patricia Aufderheide and Peter Jaszi, professors of communications and law, respectively, at American University, both to research the challenges confronting artists, scholars, and curators who seek to use third-party copyrighted material and to assist CAA in developing a code of best practices for fair use. Professors Aufderheide and Jaszi, with graduate fellows Bryan Bello and Tijana Milosevic, have drafted the attached issues report, which is the culmination of the first phase of this project. Based on interviews with one hundred visual arts professionals and a survey of CAA members, the report documents current practices and attitudes among visual arts practitioners (including artists, scholars, editors, and curators) regarding copyright and fair use. We are grateful for the assistance of the CAA Task Force on Fair Use, the project advisors, the CAA Committee on Intellectual Property, and the Community Practices Advisory Committee, the last comprising prominent members of the visual arts community, who read earlier drafts of the report. A list of participants is included in Appendix C.
Building on the report, CAA will move ahead with the remaining three phases of the project. In 2014, during Phase 2, in five cities nationwide, CAA will host small group discussions among visual arts professionals, guided by Aufderheide and Jaszi, to ascertain where there is consensus with respect to fair use in particular cases. In 2015, during Phase 3, that consensus will be synthesized into a draft code of best practices, which will also be reviewed by a legal advisory committee. The code will be presented to CAA’s Board of Directors for adoption. In the project’s final phase, the code will be disseminated widely in the field. CAA hopes that the final document will be adopted by its affiliated societies and other related organizations and institutions. Developing a code of best practices for fair use will, we hope, reduce some of the present uncertainties surrounding fair use, and facilitate creativity and scholarship. CAA also hopes that the process of researching and documenting practices with respect to fair use will foster a constructive dialogue among artists, curators, and scholars, many of whom both own and use copyrighted works. On behalf of the many CAA members who have devoted their time and expertise to shaping this phase of the project, and with enormous gratitude to Professors Aufderheide and Jaszi, we are pleased to be able to share their issues report. We have many people to thank in preparing this document. Our teams at American University were sterling. Angelica Das, associate director of the Center for Media and Social Impact, coordinated with aplomb. Washington College of Law students Ken Brady and Jane Wise provided significant research assistance. Janet Landay, program manager of the Fair Use Initiative at the College Art Association, offered invaluable support. We have benefited enormously from the views and critical readings of drafts of this report by Jeffrey Cunard, Gretchen Wagner, Anne Collins Goodyear, and Linda Downs. Project advisors Virginia Rutledge and Maureen Whalen offered valuable advice at key moments in the research process. We are grateful to the CAA’s Task Force on Fair Use, Community Practices Advisory Committee, and Committee on Intellectual Property for critical readings of this report. Each of the members of these committees is identified in Appendix C. We thank Donald J. Waters, program officer for scholarly communications and information technology at the Andrew W. Mellon Foundation, and Max Marmor, president of the Samuel H. Kress Foundation, for their confidence and support. We look forward to hearing from members of the CAA communities of practice about the conclusions of the report. • Visual arts professionals, whether artists, scholars, educators, professors, editors or publishers, museum professionals, or gallerists, share a common problem in creating and circulating their work: confusion and misunderstanding of the nature of copyright law and the availability of fair use—the conditioned right to reuse copyrighted material without permission or payment. • Fair use is flexible, available, and even core to mission for many visual arts activities. • Members of the visual arts community typically overestimate risk of employing fair use, which leads them to avoid it, even in circumstances where the law permits and so doing would not harm personal relationships needed for their work. • They pay a high price for copyright confusion and misunderstanding. Their work is constrained and censored, most powerfully by themselves, because of that confusion and the resulting fear and anxiety. • The highest cost is the “missing future,” the scholarship undone, the knowledge not preserved for the next generation, the creative use of digital opportunities truncated. • Although both artists and others in the visual arts community share these problems, artists are more likely to use copyrighted material without licensing it, and less likely to abandon or avoid projects because of copyright frustrations. • There is widespread and often urgent interest in the visual arts community in finding ways to address permissions culture. • Establishing shared understandings of best practices will improve capacity to create, innovate, document, preserve, analyze, educate and disseminate the visual arts. The visual arts communities of practice share a common problem in their confusion about and misunderstanding of the nature of copyright law and the availability of fair use. Their work is constrained and censored, most powerfully by themselves, because of that confusion and the resulting fear and anxiety. More and better work can be done through a fuller understanding of copyright, without impairing the ability of artists and art historians to receive credit for, maintain appropriate control over, and monetize their work. The visual arts field is pervaded with a “permissions culture,” the widespread acceptance that all new uses of copyrighted material must be expressly authorized. This assumption has taken its toll on practice in every area of the visual arts field, adversely affecting the work of art historians, museums, publishers, and artists. As digital opportunities emerge, old frustrations with this permissions culture have taken on a new urgency. The latter two reasons reflect, in part, tightly interconnected relationships in the visual arts field, and the fact that many professionals play multiple roles. Seeking permission has been seen as the safe, respectful, and—sometimes—unavoidable option where a wide range of uses within the visual arts communities of practice are concerned. But many in the field need to access copyrighted work without permission in order to accomplish their professional missions. Interviews and survey data show that visual arts professionals hold contradictory views on the topic of copyright permissions culture. They simultaneously believe that the unlicensed use of copyrighted material can be critical to performing their creative or scholarly work and, at the same time, that permissions are uniformly required for any use that may attract public attention. They often lack the vocabulary to articulate why and when reliance on fair use, designed to facilitate new creativity, is appropriate. Without such a vocabulary, they often default to permissions. Many visual artists and visual arts professionals are attempting to address aspects of the permissions paradox by creating open resources that make material they themselves control more widely available. Resources such as Creative Commons and open access have many benefits but are, sadly, of no use in the prevalent situation of repurposing copyrighted work that has not been licensed. In the absence of confidence regarding how to take advantage of the right of fair use, professionals cope by overspending on permissions; delaying projects for months, years, or even decades to negotiate permissions; compromising projects by doing without important material; and even abandoning some projects altogether. Members of the visual arts communities of practice encounter copyright permissions issues in connection with virtually every aspect of fulfilling their professional responsibilities—ranging from an artist’s creation of work that references popular culture to an art historian’s focus on a contemporary artist, to a teacher’s compilation of curriculum materials, to a museum exhibition and catalogue, to scholarly and art publishing. In all these contexts, the economic and noneconomic consequences of avoiding fair use are significant. Many interviewees indicated that the monetary and opportunity costs of seeking permissions, including not only fees but also salaries and volunteer time, were significant to their institutions. Even more urgently, interviewees and survey respondents registered the cost to the field of delays and inferior work—the largest cost of all being the erasure of the imaginative future, as a result of self-censorship. One-third of all respondents to a survey administered by the College Art Association reported that they had abandoned or avoided a project because of real or perceived copyright problems. Among editors and publishers, the figure was the highest: 57 percent. One-fifth of artists reported avoiding or abandoning a project because of copyright-related self- censorship. • Scholarship is published without relevant illustrations, or not published at all. One editor said frankly, “You lose academic freedom because of copyright problems.” Another said, “I self-censor all the time because I don’t want to deal with the headache of getting the image out there.” Academic journals cannot be digitized because of the costs of renewing permissions previously obtained for publication. In fact, while permissions may be required for some kinds of artistic and scholarly projects, in many cases they are not. The pervasive permissions culture, exercised as if fair use were not available to the visual arts communities, changes and even deforms the work produced. These losses affect future generations and the future of the field itself. However, these losses affect not only today’s future professionals, and all those worldwide who cannot obtain digital access to inspiration that could influence and shape their artistic and career choices, but also students, museumgoers, readers, and others who have previously been considered to be audiences of the visual arts—in a digital era all are cocreators of new culture. They are all being denied work that has had to be aborted, abandoned, or executed in an inferior way because of insecurity about fair use. That denial is simultaneously the erasure of a possible future. Uncertainty about copyright and fair use within the visual arts communities is a problem that the communities themselves can address. The biggest single issue for professionals is understanding their rights as new users of existing copyrighted material. This can be remedied not only by educational projects but by the formation of a consensus within the communities of practice about the shape of a code of best practices in fair use for the visual arts. Such codes have vastly improved access to fair use for other communities of practice. This study explores the cost to mission for the professions of College Art Association members as a result of avoiding the copyright doctrine of fair use, which provides a conditional right to reuse others’ copyrighted material without first obtaining permission to do so. The study is tightly focused. Its subjects were artists and other visual arts professionals who engage in the activities and generate the new products that define the field. The study focuses only on US- based practice, since fair use is a feature of US law, and even when visual arts professionals use international material, US-based practice depends upon US law.1 It does not examine copyright issues in general, including open access and licensing approaches such as Creative Commons. These are interesting and sometimes useful tools, and where they function the possibility of fair use need not be considered. Most copyrighted material that visual arts professionals may wish to repurpose, however, is not currently available for use under such licenses. After providing a platform of knowledge about study methods, copyright, and the visual arts communities of practice, this report looks at the current situation, describes attitudes in the field about copyright and fair use, examines emergent practices that respond to the growing problem of constraint by copyright, and examines the consequences of those practices. Fair use is of critical importance to the work of visual arts professionals. They share a dedication to the practice and scholarship of visual expression, whether in the creation of art or of work that analyzes, showcases, preserves, disseminates, or fosters discussion about art. All of these individuals play different and critically important roles in generating visual expression and creating social meaning around it. No one in this field pursues his or her mission alone. Networks are both complex and tightly woven. Artists depend upon dealers, gallerists, curators, educators, art historians, and publishers to circulate their work and provide it with a social location and meaning. Art historians depend on librarians, archivists, museum professionals, and artists and their estates, among others, to maintain and provide access to materials, and on editors and publishers, among others, to circulate their work. Editors, publishers, archivists, and museum professionals similarly depend upon the other professionals in this ecology for their own activities. Third-party copyrighted material is critical to much daily practice in the field. While images feature prominently in discussions about copyright concerns, in fact visual arts practice also features pervasive use of textual third-party copyrighted material (particularly in scholarship). Increasingly, material from all media—text, sound, images, moving images—is becoming a focus of interest, as artists, museum professionals, art historians, teachers, and editors increasingly adopt multimedia formats. The current default practice in the field is to request permission for most scholarly and other discursive uses of actually or presumptively copyrighted material, as well as for its use in the creation of educational materials. This process touches almost everyone’s decision making. Many professionals who generate new work also serve as gatekeepers in the permissions process. Art historians sometimes direct student choices of copyrighted material, and editors do the same for art historians. Gallerists may decide whether to represent an artist based on copyright issues, while archivists may decide whether researchers should have access to copyrighted material. Within museums, some staff members may find themselves functioning as gatekeepers in connection with the projects—and, in particular, the online initiatives—of others. In addition, some specialized entities have emerged as intermediaries for permissions (Bielstein, 2006). The Artists Rights Society (ARS) and VAGA represent artists and those who derive rights from them, acting as intermediaries in the permissions process. ARTstor provides a digital repository to which a variety of institutions belong, facilitating open access to visual content in some cases and providing a venue for negotiation in others. In addition, some artists’ estates and foundations directly control rights to reproduce images and sometimes also assert right-of-review regarding what is written about the artists they represent. • scholarship: obtaining appropriate material (e.g., images , audio, video, text) to analyze and illustrate analysis; accessing archival materials; executing large-scale academic projects on twentieth- and twenty-first-century art. This study focuses on the professions represented by CAA membership; those who, “by vocation or avocation are concerned about and/or committed to the practice of art, teaching, and research of and about the visual arts and humanities.”3 This includes archivists, artists, art educators, art and architectural historians, art librarians, critics, dealers, designers, editors, gallerists, museum professionals of several kinds, publishers, and students of these fields (see fig. 1). We interviewed, as a percentage of the total pool of interviewees, a greater number of editors, publishers, and museum professionals than are proportionally represented in CAA’s membership, in order to understand the experience of copyright considerations in those arenas, knowing they have a great effect on other CAA constituents. Of the one hundred people interviewed, thirty-five are currently CAA members, although all were contacted via the personal networks of CAA members. The survey was designed with input from principal investigators and project advisors of CAA’s fair use project, and involved questions requesting responses from a specified set of choices as well as open-ended questions. Some of the open-ended questions were subsequently coded, where relevant; other open-ended questions were harvested for the range of replies and for specific anecdotes. The survey respondents generally reflected CAA’s membership (see Q2 in Appendix A). The great majority of respondents were based in the United States, with some international contributors; statistical testing showed no significant differences in the responses between domestic and international respondents. Therefore, no segmentation of international responses was made in reporting the results. Survey respondents, as well as professionals interviewed at length, typically were experienced members of their fields. While almost all interviewees had been in their current or related fields for more than a decade, about 17 percent of survey respondents were relatively new to their fields (employed for less than five years). More than two-thirds of respondents, as responses to Q3 show, had more than ten years of experience in their fields. A review of relevant legal literature, as well as informal conversations and experiences at professional meetings, provided critical background knowledge and is incorporated here where relevant. Information for this report was garnered under conditions of anonymity, in accordance with our agreement with the Institutional Review Board for the Protection of Human Subjects at American University. All interviewees signed or otherwise approved an informed consent form (Appendix B). Everyone participated under conditions of anonymity. The survey instructions promised confidentiality for all specifics in open-ended answers. Rights holders were not always promised anonymity, as they mainly discussed terms of business, but all requests for confidentiality were honored. To discuss current beliefs and practices around the use of third-party copyrighted material in the fields of visual arts, the discussion below summarizes copyright law, existing literature regarding copyright as it relates to visual arts practices, and copyright litigation in the visual arts. Never has the copyright doctrine of fair use been so readily available to so many, particularly in the scholarly, educational, and publishing environments. Nor, given the range of copyright claims and remedies now potentially available to rights holders, has the role of fair use ever been so important. Creators, scholars, and others today make decisions about using copyrighted material in a legal environment where more works are protected for longer periods, with potentially draconian punishments for infringement and subject to narrow and sometimes outdated specific exceptions. The fair use doctrine within copyright law nevertheless remains misunderstood and under-used in the visual arts communities. Fair use is crucial to the policies embedded in US copyright law. The goal of that law is to promote cultural flourishing: to foster the creation of culture and the exchange of ideas. Its best-known feature is the protection of owners’ rights. However, copying, quoting, and generally reusing existing cultural material can be a critically important part of generating both new culture and commentary on it. In fact, the value of copying is so well established that it is written into the social bargain at the heart of copyright law. US law confers limited property rights to creators to encourage them to produce science and culture; at the same time, it guarantees that all works eventually will become part of the public domain and, in the meantime, gives other creators and speakers the opportunity to use copyrighted material without permission or payment in some circumstances. In the absence of the second half of the bargain, society could lose important new work. The first way that US copyright law implements the social bargain is to give creators not only an array of economic rights (against unauthorized copying, adaptation, distribution, display, and the like) but also, in the case of original works of visual art, to provide a very limited set of moral rights—the result of the 1990 amendment of the Copyright Act to include (at section 106A) the provisions of the so-called Visual Artists Rights Act (“VARA”). The second part of the social bargain conditions those rights, both with limits on what can be copyrighted, and also with exceptions and limitations to copyright. Among these, the so- called fair use right has become the most important. Fair use is a user’s right and is critical to free expression.5 In fact, the US Supreme Court has pointed out that fair use helps resolve conflicts between copyright and the First Amendment;6 without fair use and related exceptions, copyright could create an unconstitutional constraint on free expression. The fair use doctrine, developed by the courts and codified in the 1976 Copyright Act, is a fundamental linchpin of the U.S. copyright system. Along with the idea/expression dichotomy, the fair use doctrine is a critical means of balancing “the interests of authors and inventors in the control and exploitation of their writings and discoveries on the one hand, and society’s competing interest in the free flow of ideas, information, and commerce on the other hand.” It is also a vital “built-in First Amendment [accommodation] in copyright law.” [US Department of Commerce Internet Policy Taskforce, 2013, p. 21, quoting Sony Corp. of America v. Universal Studios, Inc., and Golan v. Holder, 132 S. Ct. 873, 890 (2012)]. • Did the unlicensed use “transform” (repurpose) the material taken from the copyrighted work by using it for a different purpose than that of the original, or did it just repeat the work for the same intent and value as the original? These two questions collapse the “four factors.” The first question addresses the first two factors, and the second rephrases the third factor. Both key questions touch on the fourth factor; whether the use will cause excessive economic harm to the copyright owner. If the answers to these two questions are yes, a court is likely to find a use fair, even if the work is used in its entirety. Since the early 1990s, courts have made it clear that in order for a use to be considered “transformative,” it does not have to modify or literally revise copyrighted material. Uses that repurpose or recontextualize copyrighted content in order to present it to a new audience also may qualify. In practice, the argument for considering a use to be transformative is likely to be advanced where the user (or someone on the user’s behalf) can give a coherent account of how and why the material was borrowed. How judges interpret fair use affects the ability of members of the visual arts communities to employ it; how any community employs it affects judges’ interpretations. For any field of activity, lawyers and judges consider the expectations and practices of a specific community of practice. This is why some communities of practice have asserted their best practices in fair use in consensus documents, which have had remarkable power to affect subsequent practice (Aufderheide and Jaszi, 2011). Exercising fair use is a right, not an obligation. In the visual arts communities, as in many others, people may choose licensing, either as the path of least resistance or because of the importance of maintaining business or professional relationships, over employing their First Amendment rights. They may have powerful ethical or business reasons to reject the fair use option—for instance, wanting to honor the rights of indigenous people whose art was created within their own cultural context, or wanting to remain on good terms with an influential artist. Nevertheless, fair use is a powerful, flexible, useful, and sometimes essential tool to accomplish many activities undertaken by members of the visual arts communities of practice. Fair use involves risks, like every exercise of rights. Perfect safety and absolute certainty are extremely rare in copyright law, as in many areas of law and life. However, people cannot conduct appropriate or responsible risk management without knowledge of current practice or community agreement on acceptable practice. This is especially true given the costs of actual (or even threatened) litigation in terms of time, money, and reputation, and the risk (more theoretical than practical) of high statutory damages. Without more useful grounded knowledge about copyright and fair use, visual artists and other visual arts professionals will inevitably overestimate risk. This is the situation in which members of the visual arts communities now find themselves. Fair use is accessible, favored in the courts, appropriate for many uses in the field, and yet vastly underused, with serious consequences for the future of the field. In the fields of practice encompassed by CAA membership, the intersection of copyright, fair use, and creative practice is being addressed in the literature with increasing frequency. However, no work to date has specifically addressed the costs to the field of not employing fair use. Some works address copyright issues as they affect all domains of practice in the art world (Adamson, 2012; Buskirk, 2012; Buskirk and Nixon, 1996; Sinaiko, 2013). Some work produced outside the field discusses practices relevant to and originating within the visual arts world (Aufderheide and Jaszi, 2011; Boyle, 2008; Hyde, 2010; Mazzone, 2008). Most work generated within the visual arts communities is specific to the location of the authors’ community of practice. For archives, museums, and educational entities, little has been written on copyright-related concerns (Weil, 1997), but museum permissions officers have discussed them in the context of the complexities and ambiguities of their duties (Keshet, 1997). A growing literature, however, discusses the problems that copyright compliance can pose for various digital initiatives (Silverman, 2011). Schools and libraries suffer from inappropriate copyright guidance relating to digital uses of content in education (Hall, Evans, and Nixon, 1997; Sundt, 1999). Institutional initiatives to provide comprehensive online documentation of collection holdings and related items (Edwards, 2013; Tanner, 2004; Zorich, 2012) are increasingly fraught as more institutions make relatively high-resolution images available, generally on an open access basis (Kelly, 2013; Shincovich, 2004). One of the highest-profile recent discussions of collection digitization policy and practice, the Smithsonian Institution’s 2013 Best of Both Worlds (Clough, 2013), expresses concern about copyright risk.7 Nevertheless, the Smithsonian’s own public-licensing guidelines encourage the public to take advantage of fair use (www.si.edu/Termsofuse). With regard to scholarly work, little scholarship deals directly with copyright and scholarly production, apart from Susan Bielstein’s invaluable Permissions, a Survival Guide: Blunt Talk about Art as Intellectual Property (Bielstein, 2006). Most recent studies focus, instead, on systematic changes in the production and publication of art history and art criticism (Mainardi, 2011; Rubin, 2011). Some work focuses, though not exclusively, on the implications of new technology (McGill, 2006; Westermann and Ballon, 2006). Concerns for copyright issues figure significantly, though not always centrally, in discussions of digital scholarship. For example, Waltham explores how institutional copyright policies, moving toward open access, might create new opportunities for scholarly publication (Waltham, 2009). A number of studies of scholarly production and publication touch upon copyright and fair use in the process of considering other issues, and recognize the significant costs of an endemic permissions culture in the visual arts as well as, increasingly, in emergent digital environments. Among explanations for the persistence of the permissions culture evident among art historians are arguments that institutions enforce conservative approaches; that scholarship and publishing reflect assumptions derived from analog practice (Whalen, 2009); that the general culture is increasingly litigious while the art world is commercially overheated (Buskirk 2012); and that changing revenue flows and economic models encourage rights holders to seek additional rents from licensing (Crews and Brown, 2010; Weber-Karlitz, 1983). In literature on copyright and artistic production, artist-on-artist image appropriation is perhaps the most popular topic. Some of these writings represent serious considerations of difficult issues from the working artist’s point of view—for example, Martha Rosler’s discussion of the distinctions between art photography and photojournalism (Rosler, 2004), Virginia Rutledge’s recent dialogue with Penelope Umbrico (Rutledge, 2013), and the articles collected and recently published by the New Media Coalition from the symposium ”Found, Sampled, Stolen: Strategies of Appropriation” (New Media Coalition, 2012). Other helpful contributions have been written by observers of the art scene, focusing on the extent to which the reuse of images has become a convention of artistic practice (Hick, 2011; Pollack, 2012) or reflecting on the consequences of confusion about copyright principles among nonartist professionals such as gallerists and curators (Tully, 2012) and graphic artists (Heller, 1996). Still others consider the semantic disconnect between artists’ thinking about copying and the cognate legal framework (Leach, 2002). This strain in the literature began in the mid- 1990s (Ames, 1993; Jaszi 1994) and has continued intermittently to the present day (Markellou, 2013), spiking when significant cases relating to this issue are decided in the courts. Thus, for example, a new spate of articles has begun to appear with commentary on the recent decision in Prince v. Cariou; and numerous blog posts have been posted on the Second Circuit Court of Appeals’ decision (Boucher; Heddaya; Robertson; Sarmiento; Tasis, all 2013). This work contributes to a larger online literature, both in the art world (visible, for instance, on the aggregator site artsjournal.com) and beyond it. There are few copyright decisions relating directly to the visual arts practices focused on in this report, and those that do have little predictive value, with one exception: Judge Kaplan’s decision inBridgeman Art Library v. Corel Corp., 25 F. Supp. 2d 421 (S.D. N.Y. 1998). This judgment, resolving a controversy between two private, for-profit entities with significant stakes in the outcome, has matured over fifteen years into a de facto industry standard, despite the fact that it has never been followed (or perhaps because it has never been significantly challenged) in any other court. Bridgeman, which states that routine photographic documentation of paintings is insufficiently “original” to qualify for copyright protection, has been widely used as precedent to enable the wider circulation of images representing two-dimensional objects in museum and other institutional collections. Many survey respondents and interviewees were aware of this decision, although their understanding of the decision was not always accurate or assured. Other copyright issues affecting visual arts museum practice appear to have gone unlitigated, as discussed below. This may be because, unlike in Bridgeman, the parties in conflict have not deemed the financial stakes around those issues to be great enough to generate serious legal disputes. It may also reflect the fact that conflicts about these issues tend to be resolved through settlements or compromises that leave no public record, but that may nevertheless influence future institutional practice. Likewise, no legal decisions address directly the manifold issues that visual arts academics face with regard to scholarly publishing. The fair use decision involving Georgia State University, Cambridge Univ. Press v. Becker, 863 F. Supp. 2d 1190 (N.D. Ga. 2012), now on appeal, only addresses the use of scholarly texts within the ereserve context in higher education. The case is on appeal, but the district court’s decision certainly favors using excerpts from copyrighted content in teaching. However, there is strong authority for the proposition that even extensive illustrative use of copyright materials can constitute fair use, as in Sundeman v. Seajay Soc’y, 142 F. 3d 194 (4th Cir. S.C. 1998). There is equally robust recent support for the proposition that visual illustrations (including complete images of various dimensions) can constitute fair use in nonscholarly texts, in Warren Publ’g Co. v. Spurlock, 645 F. Supp. 2d 402 (E.D. Pa. 2009) and Bill Graham Archives v. Dorling Kindersley Ltd., 448 F. 3d 605 (2d Cir. 2006). Although scholarly publications in journals and monographs seem to present an even stronger instance of fair use, courts have not spoken to this question. Finally, in a handful of cases, courts have assessed whether instances of appropriation art infringe copyright. The results, while not wholly consistent, show significant liberalization in the judicial application of the fair use doctrine to such situations over the past twenty years. The three cases involving the artist Jeff Koons—Rogers v. Koons, 960 F. 2d 301 (2d Cir. 1992); United Feature Syndicate v. Koons, 817 F. Supp. 370 (S.D. N.Y. 1993); and Blanch v. Koons, 467 F. 3d 244 (2d Cir. 2006)—illustrate the increasing receptivity of judges to the notion of “transformative” fair use in cases involving the visual arts. They also show the power that artists can exercise over legal outcomes when they provide a clearly stated rationale for their acts of appropriation (Aufderheide and Jaszi, 2011). A decision in Lang v. Morris, 823 F. Supp. 2d 966 (N.D. Cal. 2011), in which a group of origami artists challenged the defendant painter’s appropriation of the “crease patterns” from their three-dimensional paper creations in her canvases, might have proved enlightening. Unfortunately for guidance to the field, the case was settled soon after the original complaint was dismissed on procedural grounds. Two recent decisions involving Mr. Brainwash, the tarnished “star” of the widely discussed film, Exit through the Gift Shop: A Banksy Film, suggest that without a narrative an artist faces an uphill battle in establishing himself or herself as a fair user, and that judges may also be influenced by considerations such as the legitimacy of the artist’s claim to that designation. The outcomes of these decisions, in Friedman v. Guetta, 2011 U.S. Dist. LEXIS 66532 (C.D. Cal. May 27, 2011), and Morris v. Guetta, 2013 U.S. Dist. LEXIS 15556 (C.D. Cal. Feb. 4, 2013), may be of limited precedential value, because the court appears to have decided that Mr. Brainwash was simply not enough of an artist. The Second Circuit Court of Appeals’ recent decision in Prince v. Cariou, 714 F. 3d 694 (2d Cir. 2013), failed to be the definitive decision many had hoped. At issue were artist Richard Prince’s reinterpretations of images that photographer Patrick Cariou had taken over the course of six years spent living among Rastafarians in Jamaica; Prince’s techniques involved enlarging and modifying, often by over-drawing, Cariou’s images. The decision concludes that twenty-five of Prince’s large-scale works represent transformative fair use, while sending five back to the district court for further consideration. This judgment cements the general proposition that the doctrine has broad application to the creation of value-added new works that incorporate preexisting ones. It also reinforces an important, though noncontroversial, proposition: in order to be a fair use of a work, an adaptation need not represent a commentary on that work. The Prince v. Cariou decision also leaves important questions unanswered, among them the relative importance of a creator’s narrative about his or her artistic intentions to fair use analysis. On the one hand, the court seems clear that the artist should not have the last word: “What is critical is how the work in question appears to the reasonable observer, not simply what an artist might say about a particular piece or body of work” (707). On the other, its opinion appears to attach significant weight to Prince’s testimony that “what I do is I completely try to change it into something that’s completely different. . . . I’m trying to make a kind of fantastic, absolutely hip, up to date, contemporary take on the music scene (706–707).” In addition, the court’s distinctions between the twenty-five works that the majority considered to be clear examples of fair use and the five about which they were uncertain are difficult to parse. What is clear from the pattern of fair use law more generally over time, however, is that when judges can understand how a creator is adding value to a work, it is easier for them to see how that work might be transformational (Madison, 2004). The Shepard Fairey case, widely publicized in all media and especially in visual arts circles, is well known but offers no guidance. Fairey, a noted contemporary and politically engaged artist, circulated a poster during the 2008 election of then-candidate Barack Obama featuring the word “HOPE.” When the Associated Press charged that he had infringed on a news photographer’s copyright, Fairey himself initiated a lawsuit, and asked the court for a declaratory judgment on his fair use. However, Fairey eventually admitted that he had intentionally deceived the court by lying about which photograph he had used, and the case then was settled. Fairey’s case did not set precedent or otherwise affect the reliability and flexibility of fair use law. Even had the courts addressed the fair use issue, their guidance would have been of limited precedential value for the most difficult “appropriation art” scenario, in which an artist reinterprets material drawn from another’s work of visual art. Disputes that never went to court can leave an even stronger impression than settled law, according to our interviews and survey, increasing the chilling effect that results in underemployment of and confusion about fair use. Interviewees typically described rights holders as litigious, and also typically treated cease-and-desist letters as equivalent to the far more significant decision to file an actual lawsuit. A few of the artists we interviewed described experiences where challenges to appropriative uses in their artwork were settled out of court, with the help of their dealers. Likewise, rights holders told us that their issues about unauthorized use were resolved without lawsuits. From their standpoint, as well as that of users, litigation was an undesirable outcome. Nonetheless, conflicts that invoke copyright without ending in lawsuits are part of the collective memory in the visual arts communities but are often remembered as if they had been lawsuits, and thus feed the exaggeration of risk. For instance, several interviewees referred to Dennis Oppenheim’s 1992 public sculpture Virus, which featured Disney characters, as an example of the danger of lawsuits. In reality, what happened was simply that, on Disney’s demand, the Maguire Thomas company, which had commissioned the work, took it down.8 Interviewees also referred to a 2005 public dispute between photographer Susan Meiselas and digital artist Joy Garnett, over Garnett’s repurposing of Meiselas’s photo in an artwork. In reality, despite the publicity, little happened; Meiselas and Garnett met to talk, and Meiselas withdrew her demands (Aufderheide and Jaszi, 2011). Finally, there is no litigation and indeed no law whatever on “secondary” liability for an artist’s unlicensed use of copyrighted material, although some respondents expressed concern about this. Such perceptions of risk may be based, in part, on misunderstanding of copyright litigation regarding practices such as the file sharing of music. In fact, there is no theory under which such indirect liability could be imposed on, for example, a scholar or museum. The sparse record of legal decisions, along with rumor and misunderstanding, in this arena gives rise to uncertainty. Uncertainty, in turn, leads all too easily to a generalized and exaggerated sense of risk.9 The visual arts communities cannot expect to arrive at a useful understanding of fair use by examining a small handful of factually specific decided cases, nor by waiting for a “test case” that would resolve the uncertainties. Members of these communities, however, could make progress toward better fair use decision making by developing best practices in the field. In this section we discuss existing practices and attitudes around the use of third-party copyrighted material in visual arts practice, in three respects: the nature of prevailing permissions culture; pressures toward change in that culture; and competing values within the field. To use a term employed by Susan Bielstein and others, there is a “permissions culture” in visual arts communities around third-party copyrighted materials. The problem of permissions is ever present, because copyrighted work is ever present. Among the CAA members surveyed for this study, nearly 70 percent said that they had used the copyrighted work of others in their own work, with much higher rates of use among the nonartist professionals (Q5). 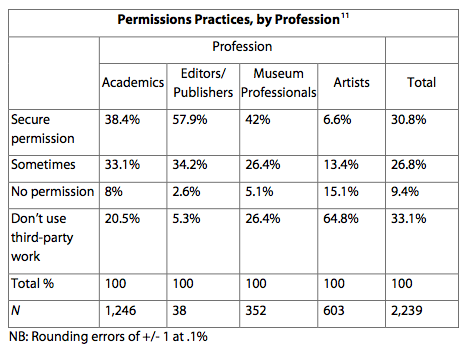 Almost everyone in the editors/publishers group had used the copyrighted material of others; the figure is also very high for curators, who here are included under the general category of museum professionals. The smallest percentages were among artists, only 37 percent of whom said they had employed the copyrighted works of others. Thus, from the perspective of the use of copyrighted materials, the field is bifurcated between artists and all those who depend upon artists’ work to create their own. Over the last thirty-five years, the permissions culture has grown until it has become the most common way to deal with managing third-party copyright issues in the visual arts, as it has in so many other fields of cultural practice. This is in part a result of the expansion of copyright put in motion by the 1976 reform of the Copyright Act, and reinforced by subsequent legislative and statutory changes. Most cultural and commercial artistic and literary productions from the 1920s to the present—including those never intended for public distribution, such as sketches, notes, and ephemera—are now protected by copyright. In addition, copyright term extension, the restoration of copyright for foreign works previously in the public domain, changes in the modes by which copyright damages are calculated, and broadening of the so-called adaptation right provided in copyright law, have all contributed to the trend. Many researchers have noted the pervasiveness of the permissions culture. Patricia Rubin called licensing and permission fees in art history often “prohibitive” (Rubin, 2011), and researcher Diane Zorich argued that the process of finding illustrations for academic research was made “more onerous by the conservative, risk-averse nature of the discipline, which shies away from invoking fair use even in instances where it is clearly applicable. As a result, scholars spend huge amounts of time and large sums of (often their own) money licensing images for their publications” (Zorich, 2012, p. 32). Lawrence McGill found that the costs of publishing in art history had grown more dramatically than in scholarly publishing generally, because of the permissions culture (McGill, p. 3). Awareness of copyright has grown, and some people we interviewed commented on the changes. One artist who had come of age in the 1980s and recently returned to a project from that era, noted ruefully, “The whole issue has become fraught in the way it wasn’t in the early 1980s.” Because the US recognizes foreign copyrights under international treaties, artists and other visual arts professionals face demands from European museums, archives, and rights holders that may rival and even exceed those of their US counterparts in terms of aggressiveness. Some scholars interviewed believed that adding to the growth of the permissions culture were, paradoxically, attempts to reduce friction resulting from it. They argued that before the advent of ARTstor, which charges subscriptions, university art departments employed fair use routinely, and that the current availability of preauthorized image databases, in which public-domain materials may predominate, not only discourages reliance on fair use but may inadvertently skew academics’ choices of illustrations. ARS and VAGA, both entities created to facilitate permissions, have become major gatekeepers, with a default position that all use requires a license. Professors who were interviewed also participated in the permissions culture, generally acceding to the universality of permissions, often because they saw no other option. Perhaps because of their acceptance of a permissions culture for publication and public circulation generally, they treasured the more private physical spaces of their classrooms (where specific exemptions to copyright law provide a further measure of security). Proper attribution was a widely shared value across all categories of professionals responding to the survey and participating in interviews. Like members of other creative communities, artists and other visual arts professionals often conflated the felt obligation to attribute, which receives only limited recognition in US copyright law, with the more comprehensively protected economic rights on which the statute focuses. Art historians faced a second level of permissions fees unrelated to copyright. Custodial institutions often charged them fees for access to images, sometimes purely to recover costs, sometimes to earn revenue, sometimes to ensure the quality of reproduction. These were variously termed access fees, permissions fees, and reproduction fees, and respondents often confused them with copyright permission. Half the CAA survey respondents had paid image access fees, as distinct from permissions fees, for reproduction of artworks as such (Q26). Some of them believed that these image access fees were part of a copyright obligation rather than a service charge, and interviews suggested that these charges sometimes were represented as copyright-related by the institutions that imposed them. 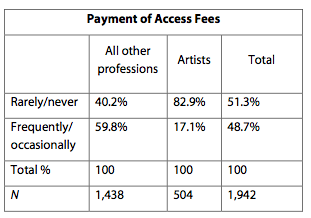 Nonartist professionals were much more likely to pay such fees than artists. Payments both for copyright licenses and access fees were a significant barrier to accomplishing work. One art historian who was publishing a book was able to obtain what he regarded as a reasonable and low-fee access to an iconic artist’s work, but even so, ARS imposed a fee high enough to add $20,000 to the cost of publishing the book. The fee was lowered dramatically after the scholar asked the artist’s estate to intervene. Another scholarly interviewee, who works on a period of art history in which all work is in the public domain, also paid about $20,000 in access fees to institutions for digital images, for the small print run of an academic book. The request process took perhaps one-third of the total research time for the book. The pervasiveness of the permissions culture was also evident in survey responses. Overall, more than two-thirds of those responding to a question about obtaining permissions to use copyrighted works in their own work (Q9, which was recoded for greater specificity) answered positively. This number was vastly larger in all the professions other than artists themselves, with a particular emphasis on publishing. Artists were by far the most likely professional group to report that they did not get permission for work they reused, and were by far the smallest group to always get permission. All other professions were much more likely to secure permission for use, although they did not report doing so invariably. This qualified, but very real, permissions culture thrives in an environment in which participants are acutely aware of their own rights as monopoly rights holders, whether they produce works of art or scholarship. Overall, three-fourths of the survey respondents said that copyright was important in protecting their own work (Q4 in Appendix A). When respondents considered the value of copyright monopoly to themselves, they responded very similarly across professions. Some 77 percent of academics, 77 percent of editors and publishers, 70 percent of museum professionals, and 80 percent of artists said this right was important to them. There was very little variation in their answers among those of different levels of experience.13 A significant minority across the population of respondents did not value their own property rights. About one-fourth of the respondents actively rejected an interest in their own copyrighted work. While the proportion of artists was slightly smaller, it too was significant. About one-fifth of all artists responding to the survey said that their own monopoly rights under copyright were not important to them. Interviewees did not have authoritative information about the economy of licensing image rights. However, most museum professionals said that image access fees (a service charge sometimes, albeit inaccurately, interpreted as copyright based) did not represent an important source of income for their institutions, but they believed that the situation might be different for others. Most museum interviewees said that licensing at their institutions was barely covering costs, if that, but concern about honoring the wishes of living and recently deceased artists or their heirs, as well as exercising control over the quality of reproduction and (to a limited extent) “downstream” uses, fueled continued interest in licensing. Recent scholarship supports the notion that this income is not significant (Crews and Brown, 2010; Kuan, 2012). Decisions about permissions appear to be made in light of, but are not necessarily governed by, economic considerations. We received a welter of anecdotal information on economic arrangements and prices, without being made privy to any financial records that could allow greater generalization. Understandably, representatives of ARS and VAGA did not share information about their fees or income. Clearly, these organizations are economically viable under current conditions, and some of the artists and estates they represent may earn meaningful income as a result of their services. ARS and VAGA charge service fees independently of artists’ royalties, even when the rights holder is willing to grant a royalty- free copyright license. Organizations that facilitate copyright permissions—such as artists’ estates, ARS, and VAGA— are sometimes seen as formidable and even intimidating forces. Many interviewees believed that ARS and VAGA sometimes demanded terms that the rights holders they represented would not. (Respondents from those agencies noted that their job is to represent the artist’s interests and confirmed that they sometimes have conversations with artists to remind them of the possibility of securing licensing revenues.) Some interviewees complained that ARS offered poorer quality images in connection with routine requests, with the option of paying higher fees for better quality. One museum professional expressed frustration at being required to negotiate with ARS for permission to reproduce a work of art that the institution believed was in the public domain (which ARS disputed) and that was in its own collection. In general, interviewees found that ARS and VAGA strongly reinforce a permissions culture. Estate representatives noted in informational interviews, conducted separately from the interviews of the one hundred visual artists and other visual arts professionals, that they often demanded permission not only for financial gain but also to control the quality and nature of the use of the artist’s work. Although editors and publishers have concerns of their own about the permissions culture, art historians often point to those individuals and institutions as significant gatekeepers, in that they control access to a prerequisite for building academic reputation and securing career advancement. Scholars we interviewed typically perceived publishers as excessively conservative, often imposing blanket requirements for copyright licenses and image permissions on book authors, with the costs usually to be assumed by these scholars. Nonartist professionals also identified significant gatekeepers on the staffs of their own institutions: general counsels, rights and permissions officers, digital-project managers, librarians, or even information technology professionals may be the individuals with the effective final say on permissions and licensing issues. One scholar who faced pushback in connection with digital projects characterized the position of a typical IT staff member as “I’m the one who gets fired if anyone gets angry.” Some interviewees found decision makers on copyright issues, whoever they may be, to be more concerned with risk than with mission. “In library departments there is always one person who is the expert, and they are often very risk averse and provide restrictive disinformation,” said one academic. The general counsel’s office at one museum would only permit work done before 1900 to be accepted as in the public domain—a conservative interpretation of copyright law. There is widespread and growing awareness of the dysfunctionality of the permissions culture, as noted by art scholars and institutional representatives (Zorich, 2012). This was reflected in our conversations as well. But with each new innovation a host of new copyright challenges emerges. Old distinctions that traditionally facilitated copyright licensing decisions—noncommercial/commercial; educational/consumer based; scholars/general public—are breaking down. Digital publishing itself is evolving awkwardly around obstacles that include but are not limited to copyright issues, as Maureen Whalen has noted, and there is continued resistance to the notion of digital publishing in academia (Whalen, 2009). Digital publishing, while enabled by authoring tools such as Scalar, is struggling with formats and software; opportunities exist to go far beyond the mere duplication of fixed pages via an online PDF, including possibilities for close analysis of digital images with rich metadata, but rights problems intervene. Thus, for example, interviews revealed that rights holders have traditionally drawn a distinction for licensing purposes between works with a print run under 2,000 and those over 2,000. Although this distinction has a rough practicality, many publishers, editors, and scholars described the standard, even in the analog era, as poorly calibrated and severely constraining in relation to their objectives. It is, of course, a useless distinction in a web-based distribution environment for born-digital materials. Likewise, rights holders have traditionally granted rights on a geographic basis, another concept challenged on the web. In their print-licensing practices, rights holders also distinguished between noncommercial and commercial environments, although in reality many web platforms are nested within commercial environments. Furthermore, many commercial environments foster nonprofit activities or educational practices conducted both in traditional ways and in crowdsourced modes that do not resemble previous educational practices, at least superficially. The permissions process in the digital environment can be idiosyncratic and ad hoc. A graduate student responding to the survey had obtained all the permissions from rights owners to use copyrighted images in a dissertation both offline and in a digital database, but legal counsel at the university was not satisfied with the wording, and so the images were not included in the dissertation. Another CAA member reported not being able to use a work of art in a Tumblr post, because VAGA objected to the platform’s standard terms of service. Many art museums are developing extensive digital databases of their own holdings. Some, such as the J. Paul Getty Museum, Los Angeles County Museum of Art, National Gallery of Art, Walters Art Museum, Yale Art Gallery, and Yale Center for British Art, are establishing “open access policies” that make high-resolution images of public domain works of art downloadable for use without restriction and free of charge. (We cite only American art museums here; many other types of museums and collections, in the US and abroad, are developing similar policies.) Museums are experimenting with platforms including Facebook and Twitter as publicity mechanisms and as ways for patrons to share and even crowd-curate exhibitions. They are showcasing artistic projects that use real-time input, including contributions from patrons. They publish digitally; they build apps. Policies on reproducing copyright-protected works of art still vary greatly at this rapidly evolving moment in digital technology. Museums work with third-party content hosts and archives, such as the Digital Public Library of America and the Google Art Project, to mount innovative virtual exhibitions, as well as to mount such exhibitions on their own sites. Rather than online documentation of physical exhibitions, these are increasingly seen as the intended destination for an assemblage of material— presentations designed for virtual space rather than retrofitted to it. “As [content hosts] more and more look to the future of virtual exhibitions, content providers like museums look more and more to them to make that future a reality,” said one museum professional. Academic research increasingly depends upon electronic databases of all kinds, ranging from text archives such as ProQuest and the Getty Research Portal, to image databases such as many museums now provide. ARTstor’s Images for Academic Publishing (IAP) initiative makes possible, among other things, the IAP program, which allows museums to make available high-quality images for scholarly use, at least where small print runs are concerned, without negotiation or payment. Academic research itself is increasingly using digital tools to search, reorganize, and even crowdsource content. In particular, scholars are developing “digital humanities” projects that take advantage of these tools to mine and analyze data in unprecedented ways. Professors teach using electronic platforms and develop curriculum ranging from the universally accessible, such as Khan Academy’s Smarthistory, to the highly specific. Many professors are independently developing databases to support their work and to share with students and colleagues. All of these activities are made more awkward both in conception and development by the permissions culture and its attendant fears. For artists the new electronic environment pushes the possibilities of art far beyond appropriation-era themes and objectives. Artists are using web imagery, often not created as an aesthetic object, as found art; working with scientists to make art from experimental processes; creating social critiques of commercial culture; producing remixes, mash-ups, and other contemporary versions of collage art; creating self-referential and ironic digital mechanisms; developing art within commercial platforms such as Second Life and Minecraft; and crowdsourcing contributions to their art. Almost all their source materials, however, may be copyright protected, even if they do not represent self-conscious artistic productions. Digital artists are moving far beyond the assumptions of the appropriation era, as one scholar told us: “The internet generation of artists isn’t thinking about their actions as appropriating. It is simply the way the internet is meant to be worked with.” The legal questions built into work that draws from and reaggregates the phenomenon of a copyrighted culture nevertheless can arise when an artist or the artist’s representatives face choices about how to distribute his or her work. Interviewees noted the broad and enthusiastic appetite of the general public for digital resources and digitally accessible information. They reported that this sense of the public’s preference drives many attempts to create comprehensive online representations of collection holdings. Those interviewed believed that they ignore this appetite at their peril. “We think it’s important to make images downloadable from our website to reach younger audiences. Social media is important,” said one museum professional. “Going to a website and seeing only a thumbnail really annoys people. Visitors see it almost as rude. They think it’s ridiculous,” said another, who believed that high-resolution access was increasingly important. Nor is this new appetite for images alone. “We get more and more requests for historical documentation, and people expect it to be available digitally,” said another interviewee. “We have so much information that people now can only use if they show up in person.” The same interviewee found that the failure to provide digital access represents a significant compromise of mission in an era when new technologies make so much more possible. Many museum professionals interviewed reported a desire to put online more visual and textual content associated with current special exhibitions, accompanied by concerns about the copyright consequences of doing so. Meanwhile, digital services are growing. For institutions and academics, ARTstor offers ways to digitally access the art collections of its member organizations. Critical Commons provides back-end multimedia support for visual arts analysis, cultural critique, and more. The Society of Architectural Historians makes public a database of architectural images called SAHARA. These are all arenas in which today’s copyright issues are magnified, especially since representatives of rights holders see new museum-based digital platforms as potential sources of additional licensing income. The evolution of these emergent practices, however, depends on clarity about the full range of rights—those of owners and users—that exist under copyright, especially fair use. As the permissions culture has increasingly clashed with digital practice, there has been an effort to address fair use. Early in 2011, the Association of Art Museum Directors established guidelines for the fair use of digital thumbnails representing artworks (AAMD, 2011). Interviewees noted that although these guidelines had been empowering for many, they had also given rise to doubts about the fair use status of small images that exceeded the stated image sizes—illustrating how, in the fast-moving digital environment, specific fair use guidelines can become outdated. There has also been a significant attempt to facilitate the employment of fair use by the Visual Resources Association (VRA). In 2012, on behalf of VRA’s Intellectual Property Rights Committee, and with the advice of a distinguished panel of legal advisors, Gretchen Wagner (then at ARTstor) drafted the VRA Statement of Fair Use of Images for Teaching, Research and Study (VRA, 2012), which addresses the concerns of visual resources librarians (and by extension educators) about image use. This document provides a powerful affirmation of the applicability of fair use in and around the domain of the visual arts, without directly addressing museum, scholarly publishing, or artistic practice. Interviewees overall expressed a polarized set of attitudes about using copyright in relation to their work. On the one hand, interviewees across professions recognized the value, even the necessity, of activities such as copying and sharing to accomplishing their work, and expressed frustration that the permissions culture can interfere with their achievement of mission. On the other, they wanted to make sure that they paid proper respect to the creativity and hard work of others, and that they maintained positive relationships with them. Copyright concerns were activated in both attitudes. This polarity was particularly evident among nonartist visual arts professionals. Art historians were acutely aware of the need to reference and quote copyrighted work, and understood it to be integral to their scholarship. Some indeed were simply exasperated that scholarly use even involved licensing, since they believed that scholarship performs a different function in the field than does an artwork itself. The fact that they typically receive no revenues from their publishing activities—and indeed often incur permissions costs left uncovered by their publishers or universities—only exacerbated their frustration; while a few scholars reported receiving significant institutional subventions, a considerable majority of those interviewed did not. Professors also saw access to copyrighted material as crucial to their teaching, which they believed kept alive the history of art from one generation to the next, and they believed that access to that history was imperative. One academic working online said that the reuse of copyrighted material was acceptable because “our job is to teach and educate.” Access was particularly important to the study of contemporary artists: “So much of the art world is about appropriation, reimagining images from other artists from other moments,” said one scholar. At the same time, interviewees, particularly museum professionals, were also very willing to defer to the preferences of real, putative, or potential rights holders. Generally, interviewees understood artists as operating outside the marketplace, which made them and their work culturally significant, while leaving the artists themselves vulnerable and in need of understanding, attention, and (in some cases) remuneration. This understanding helped some museum professionals justify their own licensing programs, and in some cases to seek licenses from others—for institutional publications, in particular— even while acknowledging that not all licenses might be technically necessary. They were readier to tolerate reliance on licensing by others, and to engage in it themselves, if the activity to be licensed fell outside their core understanding of mission. Many respondents distinguished between scholarly use, which they privileged, and “commercial” publishing; they tended to associate serious monographs and exhibition catalogues with the former. Many felt that licensing was most appropriate for merchandising uses such as magnets and mugs. Many of the visual arts professionals we interviewed found it important to honor the integrity and intent of work entrusted to them through their own image-licensing practices. “We should not make it easy to get quality copies of works when we are partially in charge of representing artists,” said one museum official. An editor noted, “If you’re using the image in a transformative way, but if the transformation takes that image in some way and bastardizes it, flips it in a way that is not the intention of the scholarly work, that’s a concern.” In one case, this editor explained, a third party reused work published by this editor for a politically controversial purpose, which greatly upset the author. “The permissions process lets us assess how the material will be used,” the editor said. Closely related to the importance they attached to honoring artists was the imperative, expressed by many visual arts professionals, to nurture positive relationships with sources, on whose future goodwill they may be dependent, even when seemingly irrational demands were made. In one case, an institution reedited a video in order to eliminate a background image of an artist’s work, merely because the artist did not want it to appear. The goodwill that derived from modifying the video “was more important than being aggressive and keeping it up there with fair use,” explained the curator. Scholars who focus on one or a few modern artists, and curators whose work involves close relationships with certain rights holders, often felt themselves hostages to those who supplied their images. Moreover, like rights holders for works of art, museums and archives wield enormous power because of their effective control of the representation of works they control; professionals in these fields may choose to license image rights from museums even when they need not do so (practically or legally) in order to remain on good terms with these sources. Artists we interviewed and surveyed were less committed to the permissions culture than members of any other professional category. They were less likely than other visual arts professionals to expect that permissions should be required as a default for uses of their own work. Interviewees were artists other than commercial artists, and they self-consciously understood their work as originating beyond the marketplace—even though many earned significant income from their productions. These artists nearly universally agreed that copying or other use of third-party material was central to their or other artists’ practice—ranging from imitating the work of a precursor to taking found images and reworking them into new works. The artists agreed universally that a work of art that had entered the public sphere was fair game for critical and scholarly commentary. Artists whose work had a political or social-commentary cast also were emphatic that typically unlicensed quotation from copyrighted work was a core part of artistic practice. One said, “Part of my premise is that these images [from popular culture] keep coming back, they harm the same people every time, just when you think they’re dead and gone, so their reoccurrence in my work is a comment on that.” This artist would not attempt to get permissions for copyrighted material being thus critiqued. Artists often also expressed impatience or disregard for the niceties of copyright; some believed that knowing more would inhibit their own creative impulses. “Steal whatever you want [during the creative process]—you do have to worry about the legal parts later,” said one. “For me to understand copyright law derails me. I shouldn’t have to know everything about this—it would hurt my work,” said another. The artists interviewed had no general expectation of receiving compensation for a wide range of secondary artistic or scholarly uses of their work. Some, however, said that they might use copyright to block use for a commercial project such as an advertising campaign, if the work was misrepresented in reproduction, or even if it was slavishly copied by another artist. One survey respondent recounted an incident in which a third party had commercialized three images. The respondent succeeded in having the offending item removed, “but if he had taken them, and posted them on his website with the proper attribution for informational purposes only, I wouldn’t have had any problem whatsoever.” One interviewee saw work derivative of the artist’s own work in a department store window and demanded payment; the artist was satisfied when the design was removed from the display. Overall, interviewees and survey respondents both indicated a desire to respect copyright owners’ monopoly rights, whether it was to honor creativity or to maintain good relations with project partners. At the same time, they all recognized the need for unlicensed access to some copyrighted material in the service of accomplishing their mission. They lacked a shared vocabulary, however, to find a way to implement both values in their work. Fair use would provide the bridge between the two values, which currently are experienced instead—and unnecessarily—as in conflict. This section discusses approaches to coping with third-party copyrighted material and the challenges of employing fair use in the visual arts communities of practice. Exaggerated risk assessment was revealed to be a major obstacle to employing or even considering the employment of fair use. Assessments of risk typically were either grounded in misinformation or altogether ungrounded. Exaggerated perceptions of risk had a greater effect on the work of nonartist professionals than on artists. Interviewees often equated conservative, even self-censoring choices with acceptable security. This concern crossed freely from the most traditional institutions to the most cutting-edge digital projects. “Better safe than sorry,” said one educator, who was undertaking an ambitious digital endeavor in which fair use was occasionally invoked. Even artists who employed fair use sometimes expressed uneasiness, believing that they had put themselves at risk. “By design fair use is a gray area, and I knew I had a fair use defense but I decided to get permissions whenever possible,” explained an artist who drew from a range of copyrighted material and did in fact employ fair use in situations where it seemed likely that getting permission would be too difficult. Art historians considered not only their own risk in using material without licensing it, but their responsibility for others’ later use of the same material. “Downstream concerns do play a role—‘If we go out on a limb, God knows what might happen and who might come after us’—we are all more trained to think that way,” explained a curator. Interviewees appeared unaware that such downstream-liability risks are not likely to arise legally in connection with good-faith cultural initiatives undertaken by museums and other institutions, to say nothing of individual academics. Art historians feared being sued by entities with far greater resources, and worried that their reputations or positions could be harmed if they were seen to exercise bad judgment. “There’s not enough money in publishing for people to take the risks, even if the threats are almost always empty,” said one scholar. “Scholars and even more their publishers are afraid of being sued even when what they want to do is clearly fair use because the lawsuit itself by a well-funded corporation or other entity would be so expensive that the publisher or scholar could go under by legal costs even if they won.” One museum professional, who is also a scholar, noted the institution’s rigid and extreme permissions policies: “I know that we are too risk-averse, because no one will probably sue us, but. . . .” Said another museum professional, “I don’t want to be the test case. I don’t want [my institution] to be sued.” They were also afraid of getting their employers or backers in trouble—often seeing themselves as embattled or threatened by potential accusations about copyright, and worried about their own standing within an organization or with a funder should they precipitate trouble. Even artists, the population in this group most likely to operate outside the permissions culture, often spoke of their choices as risky. One said, “A lot of times artists play it fast and loose until they play it poorly.” Some artists whose work incorporated that of others believed that their work could be seen as infringing. Some even cultivated an attitude of transgression; thus, artists engaged in social critique saw their copyright choices as a dare to the larger society. Overall, actual experience of trouble over copyright appears to be small. Indeed, among 2,828 survey respondents, only one person had ever experienced a formal legal conflict (quickly settled out of court) over copyright. Initial survey results may appear alarming; possibly one in ten, or more, of survey respondents seemed to experience challenges. Among survey respondents to Q15, which asks if the respondent has ever been challenged in the use of third-party works, almost 10% said yes; 5% of respondents to Q17 reported a challenge to online work. However, these results need to be understood within the context of what “challenge” meant to respondents. In their explanations (Q16 and Q18), many revealed that they interpreted “challenge” to include their own self-doubt, queries by colleagues, or established customs of the permissions culture. Thus, for respondents “challenge” often meant either self-censorship or the frustrations, delays, and distortions resulting from something other than a challenge from a rights holder. Furthermore, respondents to Q15 and Q17 were almost entirely overlapping, such that Q17 added only a few respondents to the group who answered that they faced challenges in Q15. Among people who documented, in Q16 and Q18, actions that challenged their uses of third- party material, many of the respondents to both questions referred to automatically generated online takedown or Content ID notices (two kinds of removals on YouTube). Almost universally, the respondents had acquiesced to the takedown or Content ID match, rather than claiming fair use as YouTube permits—a significant form of self-censorship. Besides the frustrations of uncertainty and existing practice, respondents also complained about rights holders contacting them with financial demands. Some had been contacted by ARS or VAGA, after which they typically reported to have negotiated or paid the asking price. Scholars had received complaints from rights holders who had searched databases such as JSTOR to identify the use of images in their articles. Others had received emails from museums and had negotiated image-licensing terms. Graduate students had been unable to upload dissertations with all relevant illustrations to ProQuest. Respondents typically acceded to requests or removed images. In any case, the endemic concern about legal risk is radically out of step with any actual experience of direct challenges, most of which appears, in any event, to be automatically generated or sent by entities with a default position of demanding permissions in all cases. The lived experience of legal action or anything close to it appears to be vanishingly small. By contrast, the belief that copyright is fraught with threatening situations appears pervasive. Interviewees and survey respondents demonstrated great creativity and goodwill in their attempts to find solutions to perceived problems with access to copyrighted material. They shared a variety of coping strategies, but they typically avoided one approach that could have addressed many problems—reliance on fair use—citing risk, uncertainty, a desire to respect artists’ wishes, and the fear of offending needed partners. • Generate and use material that is copyright free or preauthorized for use. Some visual arts professionals try to use material that is not subject to copyright restrictions, whether because it is clearly in the public domain or because it is part of a licensed package available to some academics and students through their institutions. These professionals often gravitate to the public domain, and institutions that are creating public image databases are focusing attention on licensed or public-domain materials. Several interviewees pointed out that most of art history—from cave paintings to work produced before roughly 1900—is in the public domain, and these interviewees were comfortable working within that time frame; this obviously is not a possible resort for those working in the twentieth and twenty-first century. Creative Commons and open access alternatives that anticipate and authorize use by the public were not widely employed, since much historical and commercial material is unavailable under such licenses. Nevertheless, some artists responded in open-ended comments in the survey that they routinely licensed their own new work under Creative Commons licenses, and tried to promote the use of such licenses, hinting at a larger body of available material in the future. Some scholars looked forward to the growth of open- access journals and repositories, which depend upon the generosity of contributors to provide general advance permissions for use. Today, however, even scholars who donate to such open access sites must often, in the current environment, forgo use of existing copyrighted material in their own writing. • Beg. In some cases, academic interviewees tried pleading for lower rates because they were resourceless academics, promising to use the work only for a nonprofit purpose or in the small print run for a monograph. (They often, however, pointed out that even very low rates could add up to significant fees for a book that required many illustrations.) Rights holders and their representatives explained that they expect and are open to negotiations, with special sympathy for scholarship that circulates with small print runs. Museums appear to be fairly open about this practice where image licenses are concerned, while rights holders and their representatives do not make this option public. In addition, there is some ambiguity around what constitutes nonprofit work, particularly in academic publishing; notably, working definitions based on print run do not translate comfortably into the domain of digital publishing. • Go without. Interviewees reported struggles to find work-arounds for objects that were too difficult to clear—downsizing lists of illustrations or substituting second-choice images, using line drawings rather than photographs of artifacts, choosing images of lesser value to the argument, and even stripping images from dissertations and ebooks. These decisions were reported with regret but also with acceptance, since such behavior is commonplace in the field. • Hear no evil. Students and artists sometimes ignored copyright and tried to maintain ignorance, in order to do their work uninhibited; some of those openly dreaded the day when they would have to confront realities they had avoided—leaving open the question of how much, whatever their intent, copyright considerations may have influenced their creative choices. Some of these approaches involve enormous costs, especially in time. Some are degrading, and at least one—the last—could be risky. None is working particularly well in the digital environment. Interviews in general were suffused with the anxiety, concern, frustration, and bafflement resulting from the gap between what is technically possible (and being encouraged in the wider culture) and the limits of current mechanisms and practices for the resolution of permission deadlocks. One discouraged museum professional said, “Our staff is whipped. We’re paralyzed.” In particular, as interviewees repeatedly explained, these adaptive mechanisms to cope with permissions culture are not working well in a digital era. The permissions culture is simply not compatible with the missions of museums—or, by extension, other members of visual arts communities—in the digital era. Interviewees and survey respondents (the latter in open-ended questions) occasionally reported the successful employment of fair use—always without any negative consequences. Sometimes these were last-resort scenarios, once all other options had been exhausted. Sometimes fair use was undertaken subject to extra, self-imposed conditions. One museum, for instance, puts watermarks on all images of works distributed under fair use (as well as those in the public domain). The interviewee explained that this was to prevent inappropriate uses by others. Sometimes professionals even felt obligated to alert rights holders to the use, and even to ask rights holders if fair use was acceptable. In general, those who relied successfully on fair use did not seem to share their positive experiences with others. One area in which fair use is being employed comfortably is the use of small images, or “thumbnails,” on websites. Interviewees and survey respondents reported that some institutions are relying on court rulings to the effect that small referential images produced by search engines constitute fair use, as well as on 2011 guidelines by the Association of Art Museum Directors that the use of thumbnail images of a certain size could be fair use. This “safe” approach, while having the benefit of making a reference image available, may also unintentionally limit practice, because many online visitors to museum websites have legitimate purposes that extend well beyond simple reference. Interviewees also talked about other situations in which they employed fair use. Museums sometimes include art objects in exhibitions and reproduce images of them in catalogues when they believe they have a fair use argument. A museum professional whose institution is launching an app said that the inclusion of some items relied on fair use. Another respondent decided to employ fair use when a negotiation with an artist’s intermediary organization collapsed because of high prices. “So I said, ‘We’ll have to agree to disagree on that.’ We never paid, and we never heard anything.” Several interviewees at museums said that they employ fair use if a work is “orphaned” (that is, when its copyright owner, if any, cannot be identified with reasonable effort). Some impose higher standards than others for determining when this is the case. Finally, some museums are dropping bans on photography within museums, perhaps reflecting declining concern with downstream uses of copyrighted material. In some cases, indeed, museums encourage posting and tweeting images from the galleries. I know the broad contours; I try not to get caught up in the details. A big part of me wants to just be able to make my work and not worry about it and not get permission and not be bothered about it. I draw a line between appropriation for creative purposes and appropriation for the purposes of consumption. I pay for movies and songs when I download them for my own pleasure. I’m not a copyright anarchist, but I do feel fair use ought to be much more protective of artists, especially when the use is noncommercial. Some artists we spoke with made art from a variety of found objects, including newspapers, maps, photographs, sketches, and digital imagery. One artist created such work believing that it would never be able to be published. After an exhibition, however, a university did publish a catalogue including reproductions, without asking for or procuring any permissions. Artists interviewed also reported exploring three-dimensional printing techniques replicating artwork, making digital copies of works of commercial culture, copying the work of earlier artists, and reassembling work digitally. In some cases, museums have implicitly ratified an artist’s fair use judgment by acquiring work incorporating third-party materials without including the boilerplate contract language that requires indemnification from the artist for any copyright infringement. Members of the professions represented in CAA are not only surrounded by copyright issues, but are also immersed in a culture in which much copyright information is shared, particularly about the permissions process. At the same time, very little information is provided that would allow anyone to make a reliable fair use determination. Many of the people we interviewed, and the large majority we surveyed (more than two-thirds) had received no formal copyright education or training, either in their own education or at their workplace (Q23). Among those who said that they did not receive formal education (Q24), respondents mentioned as sources of information their own institution’s lawyers, “the internet,” advice from colleagues “on the job,” listservs in which peers consult each other, gatekeepers’ comments, or even, in the words of one survey respondent, “rumor.” Some attended workshops and sessions at annual professional conferences, and some reported that the topic had been addressed in graduate school. Nonetheless, the majority of respondents to the survey expressed confidence in their copyright understanding (Q22). Nearly two-thirds rated their copyright understanding as excellent or good, and only 5 percent as poor. Apparently, formal copyright education boosted confidence; 53.3 percent of those who reported an excellent understanding had received formal copyright education. Editors, publishers, and art historians rated their knowledge higher than other nonartist professionals. Given the lack of employment of fair use and overreliance on permissions, this confidence suggests that when members of the professions in CAA consider copyright education, they think of it in terms of requirements to get permissions, rather than the range of options under copyright. This is reinforced by the fact that editors and publishers, who often reluctantly play a gatekeeper role with respect to permissions and often fail to make use of available fair use rights, are both the most confident professional group and the most likely to report having received formal training. It also suggests that members find informal knowledge an appropriate source of information for the knowledge that they depend on to do their work. The visual arts communities of practice find reinforcement for adherence to a permissions culture in workshops, in advice or demands from supervisors, lawyers, and other gatekeepers, and from peer networks. Formal education on copyright appears to increase tendencies to overestimate risk and underuse fair use. Overall, copyright knowledge tends to be partial and skewed. Fully one-third of CAA survey respondents said (Q13) that they had avoided or abandoned a project due to actual or perceived inability to obtain permission to use third-party works. Among all professions, the most likely to say that they have been unable to execute their work as a result of copyright problems were editors and publishers, a majority of whom have avoided or abandoned a project for copyright reasons. Although artists surveyed were least likely among the visual arts communities of practice to have suffered inhibition and deformation of their work processes because of copyright, fully one-fifth of those surveyed testified to abandoning or avoiding a project for copyright reasons. Of artists who had abandoned or avoided a project, only 29 percent also said that they used others’ copyrighted works frequently. Thus, the great majority of those who had abandoned projects were artists who had not chosen an artistic style or form that routinely involves the use of copyrighted material. This result points directly at self-censorship of an entire genre of artistic project. Does the mindset portrayed in the responses summarized in these pages also affect what people might do in the future? Survey responses suggest that it will. Across the board, the majority of survey respondents said that they would do new work differently if copyright were not in the way (Q20). Sixty-six percent of all those who reported that they had abandoned or avoided a project because of an actual or perceived inability to obtain permissions said they would be “very likely” to use copyrighted works of others more than they have in the past were permissions not needed. Those professions most likely to undertake new work if permissions were not required were those most likely to have canceled projects under the current regime: editors and publishers. 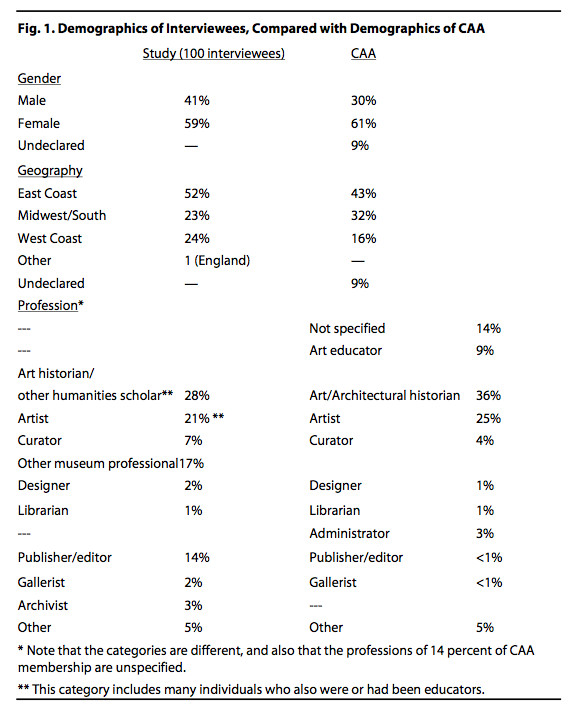 Among all nonartist professionals, three-quarters said they would be somewhat or very likely to undertake new projects (with editors/publishers most likely, and museum professionals least likely). 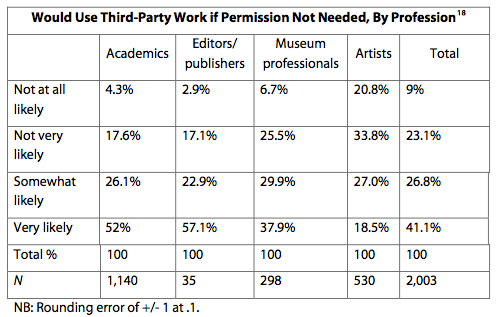 Among artists, almost half were more likely to make work incorporating third- party material if they did not need to worry about copyright—a very large number, but still much lower than that for editors and publishers. This reinforces the distinction evident throughout the survey between artists and other visual arts professionals in terms of fair use conservatism. Artists’ responses to Q20 matched expectably the proportions for answers to Q5 (In your own work, do you use the copyrighted works of others?). At the same time, artists who had abandoned or avoided a project were more likely than their peers to say that they would undertake new work if copyright did not stand in their way. This experience of both avoiding and curtailing certain kinds of work was fleshed out in stories told in interviews, and in responses to open-ended questions. This information provides ample evidence that the cost of copyright ignorance and confusion, reluctance to use the balancing features of the law, and gatekeeper pressure to enforce a permissions culture have resulted in the deformation of mission. Work has been delayed, made more expensive, or even abandoned because of the strictures of the permissions culture. The costs of compliance fall disproportionately on those with the least resources, namely, graduate students, junior faculty, and academics at institutions that do not cover permissions costs, along with scholars and independent curators, who only sometimes receive help from editors and institutions in finding out how to obtain permissions. Graduate students learn the permissions culture by spending many hours working on permissions for their professors’ work—in the process learning to avoid permissions-heavy research topics. Most academics regard the process as an exasperating distraction from their work. Individual scholars pay rights holders hundreds, thousands, and even tens of thousands of dollars to publish a monograph with a small print run. While costs can be modest for an academic article, a scholar reported that in one case costs came to between $2,000 and $3,000. Others mentioned higher figures for monographs. Period surveys often prove to be prohibitively expensive, with costs of $20,000 and beyond for permissions, but single-artist monographs can be just as high. One editor who had received an estimate from a rights agency for images to illustrate a major twentieth-century survey, requiring between 300 and 400 reproductions, reported that the cost per image was quoted at $375 (for permissions and a high-resolution image file). Even assuming a discount could be negotiated and some images obtained at no cost from galleries, rights and reproductions cost for such a book easily could approach $100,000. Today, the editor noted, when a trade art book’s typical print run rarely exceeds 4,000 to 5,000, sales can support only a fraction of that amount, perhaps $20,000 or less. Even where museum policies favor the open access use of images, information about the specific application of those policies can be hard to come by. In general, the work of securing permissions can add months or even years to production time for a project; one scholar estimated that permissions could occupy one-third of the total research time. Academics see this investment of time as most threatening to the careers of tenure-track professors. “I do worry about younger scholars entering the field,” said a senior scholar. “In tenure decisions here, time from degree to publication is very important.” The hurdles can turn into stop signs. They may make some scholars simply give up for lack of resources—whether time, money, or patience—or out of anxiety —even when they can obtain a subsidy from their own institutions. Permissions roadblocks result in deformed or even abandoned work. Exhibition catalogues may be issued without relevant images because rights cannot be cleared. Editors of art scholarship reported journal articles going to print with blank spots where reproductions should be, because artists’ representatives disagreed with the substance of the article; and one book was published with last-minute revisions and deletions of all images because of a dispute with an estate—with disastrous results for sales. Journal editors have had to substitute articles or go without an article altogether because an author could not arrange permissions in time for publication. In one case, after an author’s manuscript was completed, an estate changed position, compelling the author both to rewrite and to draw substitute illustrations. Among other things, the cost of permissions leads to less work that features historical overviews and comparisons, and more monographs and case studies. Scholarship itself is distorted and even censored by the operation of the permissions culture. Work is represented incompletely, in a different format from the one preferred by the scholar and publisher, or not at all. Rights holders impose aesthetic restrictions that amount to a claim to the artist’s significance within the context of the scholarship--for example, demanding that a work only be reproduced at a certain size or be exclusive to a page. “Aesthetic stipulations placed on scholars by rights holders often eliminate the possibility of using the work outright, given parameters of the publication,” said one scholar. Negotiating such demands is extremely time consuming, and the process can easily change or kill a project. Scholars sometimes even substitute their own drawings for reproductions of works to which they refer. Inferior images are used simply because they could be obtained without either copyright fees or permissions fees. If you want to publish an article, you’re already asking yourself, can I work around reproducing this painting? If you want to reproduce a Picasso painting, give up in advance. You can’t pay for it. You go into a different direction in your scholarship, to something that you wouldn’t like to do. Your copyright problems interfere with your scholarly thinking, and in my view that is the worst part of this whole thing. It interferes with the scholarly work. Some PhD theses are being archived digitally by ProQuest and in the students’ own institutional repositories without relevant, and sometimes crucial, images—although progress is being made on this front, thanks to the increasing recognition of fair use by ProQuest and schools alike. However, the future publication of such dissertations as monographs may be jeopardized if the researcher is discouraged from proceeding further because the topic involves too many permissions. Professors also found copyright issues to complicate the daily work of teaching, the crucial transmission of knowledge to the next generation. To a large extent, they are constrained by the limited digital-image resources of their own institutions, or their private collections—which they are unable to share freely with colleagues elsewhere. They resort to inferior- quality images because they cannot get access to those of higher quality. They often do not discuss the work of contemporary artists, images of whose work are hard to get. And they are often discouraged from making images of copyrighted work available to students online, and are thus driven to select topics that they can illustrate with images of public-domain works. Curriculum materials cannot be distributed widely because of licensing issues. The cost in time, money, and stress imposed by the permissions culture profoundly affects museum curation. Because of rights problems, “We just avoid certain artists,” noted one curator. Another stated that there are fewer group shows than previously, because of licensing problems. “Depending on how much time or money I have, I choose images that are different than I would in a perfect world—both because of money or refusal of permission,” noted a curator. One institution (to the curator’s exasperation) sought clearance for all the original material in collages that were composed of popular-culture objects, resulting in extensive staff effort and delay. After an artist refused to lend to a show organized by a curator with whose perspective the artist disagreed—effectively attempting to censor the exhibition—the curator borrowed examples of the artist’s work from other museums. However, the artist also refused to allow any images of his work to appear in the accompanying catalogue, which left the curator unable to accurately discuss the historical context of the exhibition. Museums may choose not to publish certain catalogues at all because of rights problems, creating, as one professional explained, a loss of cultural memory. In one case, an entire exhibition catalogue involving appropriation practice was simply canceled because of the concern for risk. Educational programs are limited; the potential for museum-based online education is extensive but goes partly unrealized because institutions comply with exacting policies on permissions, even for this purpose. Thus, one museum’s project to create an extended visual portrayal of the history of art was severely compromised with respect to work dating after 1922, solely for copyright reasons. Likewise, museums miss out on the opportunity to capitalize on the potential for digital distribution of collection- and exhibition- related educational materials to schools. ARS and the estates said, ‘We can identify the works in these exhibition views and you need to pay rights. ‘We were outraged. It was hard to swallow. There has been a lot of pushback recently. We have started to try and use exhibition history as a rich part of our website. And to have to pay rights for all that is ridiculous. Born-digital exhibitions are limited, changed, or not attempted. In general, digital projects are limited by the perceived need for permissions, as well as by misplaced concerns about liability for downstream uses. One museum professional described the development of an app that repackages information already available on the museum’s website, explaining that it is being challenged by ARS on copyright grounds. Smaller institutions have scrapped plans for online collections because of copyright concerns. One interviewee described a project to digitally showcase multimedia-based art that is trapped in beta because of copyright problems. The result is that valuable potential resources remain unavailable. “We have so much history not available to the public on the web, and that is becoming more and more apparent as we get more requests for our historical documentation. There are a select few who can see everything we have in person,” said one museum professional. In open-ended answers to Q14 and Q21, artists also told stories of altered or blocked work. Several described having to abandon multimedia works incorporating music because permission could not be obtained. Some found that completed work incorporating copyrighted material could not be distributed or even shown. One respondent completed a film composed solely of photojournalistic images, but the costs for permissions were prohibitively high and only available for limited periods. Another artist made a series of collages incorporating enlarged, rephotographed images of published dust-jacket photographs of authors. Advised to be cautious because the original works could be recognized despite alterations, the respondent withdrew the work from public view. One survey respondent said that a work of art could not be televised unless the respondent obtained permissions for “all aspects of the work,” causing its distribution to be limited. For all the communities in the visual arts, potentially the greatest consequences are in the areas about which our interviewees were largely silent: the areas in which they do not even consider any action. These missed opportunities are not mere inconveniences or expensive exigencies. They fundamentally distort mission. Beyond these oblique hints at what is not being done is uncharted territory. It will remain unmapped to the extent that visual artists and other visual arts professionals permit rights holders alone to determine the contours of these fields, rather than defining the boundaries themselves, consistent with fair use. Visual arts communities of practice share a common problem in confusion about and misunderstanding of the nature of copyright law and the availability of fair use. Their work is constrained and censored, most powerfully by themselves, because of that confusion and the resulting fear and anxiety. Better and more work can be done through a better understanding of copyright, without impairing the ability of artists and art historians to receive credit for, maintain appropriate control over, and monetize their work. The biggest single problem for visual artists and other visual arts professionals in copyright knowledge is understanding the rights of new users of existing copyrighted material. Within that area of knowledge, fair use is the most significant element. Fair use is a reliable right of free expression, and one that courts including the Supreme Court have celebrated as a tool to generate new culture. However, deciding when to invoke fair use must also be made on a case-by-case basis, grounded not only in the core concepts of transformativeness and appropriateness, but also in the mission of the specific community of practice. Current education and experience have distorted the understanding of fair use’s value in the visual arts communities. Risk has been magnified, and the ambiguities of fair use have been exaggerated, in part through the lack of employment of the doctrine. The primary problem in regard to copyright constraints faced by the visual arts communities of practice is members’ own confusion and reluctance to use legal options. Because there is such a vital set of reciprocal relationships in this field, with professionals functioning both as creators and as gatekeepers, they themselves can address this problem. They can identify and clarify what are best practices in interpreting fair use within their communities of practice, and thus help further their work as scholars, museum professionals, and artists. The College Art Association, with funding from the Andrew W. Mellon Foundation, will sponsor the creation of a code of best practices in fair use for the visual arts, to be failicated by Profs. Patricia Aufderheide and Peter Jaszi. Please see the PDF for the appendices. Adamson, Glenn. 2012. “Art and Copyright.” Art in America 100 (6): 77–79. Ames, E. Kenly. 1993. “Beyond Rogers v Koons: A Fair Use Standard for Appropriation.” Columbia Law Review 93 (6): 1473–1526. Bielstein, Susan. 2006. Permissions, A Survival Guide: Blunt Talk about Art as Intellectual Property. Chicago: Chicago University Press. Boyle, James. 2008. The Public Domain: Enclosing the Commons of the Mind. New Haven, CT: Yale University Press. Boucher, Brian. 2013. “Richard Prince Wins Major Victory in Landmark Copyright Suit.” Art in America. http://www.artinamericamagazine.com/news-features/news/richard-prince-wi... victory-in-landmark-copyright-suit/. Buskirk, Martha. 2012. Creative Enterprise : Contemporary Art between Museum and Marketplace, New York: Continuum. Buskirk, Martha, and Mignon Nixon. 1996. The Duchamp Effect. Cambridge, MA: Massachusetts Institute of Technology. Clough, G. Wayne. 2013. Best of Both Worlds: Museums, Libraries, and Archives in a Digital Age. Washington DC: Smithsonian Institution. http://www.si.edu/content/gwc/BestofBothWorldsSmithsonian.pdf. Crews, Kenneth D. 2001. “The Law of Fair Use and the Illusion of Fair-Use Guidelines.” Ohio State Law Journal 62 (98): 599–702. Crews, Kenneth D., and Melissa A. Brown. 2010. “Control of Museum Art Images: The Reach and Limits of Copyright and Licensing.” Paper presented at the Annual Congress of the International Association for the Advancement of Teaching and Research in Intellectual Property. Edwards, Benj. 2013. “The Copyright Rule We Need to Repeal If We Want to Preserve Our Cultural Heritage.” The Atlantic. http://www.theatlantic.com/technology/print/2013/03/the-copyright- rule-we-need-to-repeal-if-we-want-to-preserve-our-cultural-heritage/274049/. Hall, Stuart, Jessica Evans, and Sean Nixon. 1997. Representation : Cultural Representations and Signifying Practices. Culture, Media, and Identities. London: Sage in association with the Open University. Heller, Steven. 1996. ”Homage Do I Love Thee?” Print 50 (1): 170. Hick, Darren. 2011. “Toward an Ontology of Authored Works.” British Journal of Aesthetics 51 (2): 185–99. Hyde, Lewis. 2010. Common as Air : Revolution, Art, and Ownership. 1st ed. New York: Farrar, Straus and Giroux. Jaszi, Peter. 2010. “Getting to Best Practices: A Personal Journey Around Fair Use.” Journal of the Copyright Society of the U.S.A. 57 (3): 315–30. ———. 1994. “On the Author Effect: Contemporary Copyright and Collective Creativity.” In The Construction of Authorship: Textual Appropriation in Law and Literature, edited by Martha Woodmansee and Peter Jaszi. Durham, NC: Duke University Press. Kelly, Kirstin. 2013. “Images of Works of Art in Museum Collections: The Experience of Open Access; A Study of Eleven Museums.” Andrew W. Mellon Foundation. http://msc.mellon.org/research- reports/Open%20Access%20Report%2004%2025%2013-Final.pdf/at_download/file. Keshet, Amalyah. 1997. “Fair Use, Fair Trade, and Museum Image Licensing.” Visual Resources: An International Journal of Documentation 12 (no. 3–4): 281–89. Kuan, Christine. 2012. ”Maximum Museum: Digital Images, Licensing, and the Future of Museums.” Paper presented at the American Association of Museums Annual Meeting, May 2, 2012. http://www.artstor.org/news/n-pdf/maximummuseum-kuan.pdf. Leach, Dawn M. 2002. “Art World Thinking versus Legal Thinking.” Visual Resources: An International Journal of Documentation 18 (3): 205–17. Madison, Michael J. 2004. “A Pattern-Oriented Approach to Fair Use.” William and Mary Law Review 45 (4/5): 1525–1690. Mainardi, Patricia. 2011. “The Crisis in Art History.” Visual Resources: An International Journal of Documentation 27 (4): 27–40. Markellou, Marina P. 2013. ”Appropriation Art under Copyright Law: Recreation or Speculation?” European Intellectual Property Review 7: 369–71. Mazzone, Jason. 2008. Copyfraud and Other Abuses of Intellectual Property Law. Palo Alto, CA: Stanford University Press. McGill, Lawrence. 2006. “The State of Scholarly Publishing in the History of Art and Architecture.” Connexions. http://cnx.org/content/col10377/latest/. Netanel, Neil. 2011. “Making Sense of Fair Use.” Lewis and Clark Law Review 15 (3): 715–72. New Media Coalition. 2012. “Found, Sampled, Stolen: Strategies of Appropriation.” Media-N: Journal of the New Media Caucus 8 (2). Pollack, Barbara. 2012. “Copy Rights.” ARTnews. http://www.artnews.com/2012/03/22/copy-rights/. Robertson, Adi. 2013. “A Legal Victory for ‘Appropriation Art’ Expands When Artists Can Remix Each Others’ Work.” Verge. http://www.theverge.com/2013/4/29/4282168/appropriation-artist- richard-prince-wins-copyright-fair-use-appeal. Rosler, Martha. 2004. Decoys and Disruptions: Selected Writings, 1975–2001. Cambridge, MA: MIT Press in association with the International Center of Photography. Rubin, Patricia. 2011. “Defining the Crisis in Art History.” Visual Resources: An International Journal of Documentation 27 (4): 308–14. doi: 10.1080/01973762.2011.622211. Rutledge, Virginia. 2013. “The Image World Is Flat: Penelope Umbrico in Conversation with Virginia Rutledge.” Aperture. http://www.aperture.org/magazine-2013/the-image-world-is-flat- penelope-umbrico-in-conversation-with-virginia-rutledge/. Sarmiento, Sergio Muñoz. 2013. “Judicial Activism and the Return of Modernism in the Cariou v. Prince Decision.” Hyperallergic. http://hyperallergic.com/69939/judicial-activism-and-the-return-of- modernism-in-the-cariou-v-prince-decision/. Shincovich, Ann C. 2004. “Copyright Issues and the Creation of a Digital Resource: Artists’ Books Collection at the Frick Fine Arts Library, University of Pittsburgh.” Art Documentation 23 (2):8– 13. Silverman, Daniel. 2011. “Museums, Copyrighted Art, and the Internet: A Take on Fair Use.” Indiana University. http://www.indiana.edu/~spea/pubs/undergrad-honors/volumn- 6/Silverman,%20Daniel%20- %20Museums,%20Copyrighted%20Art,%20and%20the%20Internet%20- %20A%20Take%20on%20Fair%20Use%20-%20Faculty%20Paul%20Strum.pdf. Sinaiko, Eve. 2013. Gloss*. New York: Marquand. Sundt, Christine L. 1999. “Testing the Limits: The CONFU Digital-Images and Multimedia Guidelines and Their Consequences for Libraries and Educators.” Journal of the American Society for Information Science 50 (14): 1328–36. Tanner, Simon. 2004. “Reproduction Charging Models and Rights Policy for Digital Images in American Art Museums: A Mellon Foundation Study.” King’s Digital Consultancy Services, London. Tarsis, Irina. 2013. “Fair Use Fails Mr. Brainwash: Judicial Stance on Infringement and Appropriation Art Swings the Other Way.” Center for Art Law. http://itsartlaw.com/2013/05/13/fair-use-fails-mr- brainwash-judicial-stance-on-infringement-and-appropriation-art-swings-the-other-way/. Tully, Judd. 2012. “Copyright Caveat.” Art and Auction 34 (9): 43–45. US Department of Commerce Internet Policy Taskforce. 2013. ”Copyright Policy, Innovation, and Creativity in the Digital Economy.” http://www.uspto.gov/news/publications/copyrightgreenpaper.pdf. Visual Resources Association. 2012. ”Statement of Fair Use of Images for Teaching, Research and Study.” http://www.vraweb.org/organization/pdf/VRAFairUseGuidelinesFinal.pdf. Waltham, Mary. 2009. “The Future of Scholarly Journals Publishing among Social Science and Humanities Associations: Report on a Study Funded by a Planning Grant from Andrew W. Mellon Foundation.” http://www.nhalliance.org/bm~doc/hssreport.pdf. Weber-Karlitz, Dorothy. 1983. “Survey: Museums, Artists and Copyright.” Cardozo Arts and Entertainment Law Journal 2 (1). Weil, Stephen E. 1997. ”Fair Use/Museum Use: How Close Is the Overlap?” Visual Resources: An International Journal of Documentation, no. 12 (3/4): 353–59. Westermann, Mariët, and Hilary Ballon. 2006. Art History and Its Publications in the Electronic Age. Houston: Rice University Press; Washington, DC: Council on Library and Information Resources. Whalen, Maureen. 2009. “What’s Wrong with This Picture? An Examination of Art Historians’ Attitudes about Electronic Publishing Opportunities and the Consequences of Their Continuing Love Affair with Print.” Art Documentation: Bulletin of the Art Libraries Society of North America 28 (2): 13–22. Zorich, Diane M. 2012. “Transitioning to a Digital World: Art History, Its Research Centers, and Digital Scholarship.” Report to the Samuel H. Kress Foundation and the Roy Rosenzweig Center for History and New Media, George Mason University.